Before I had my son, I was able to work with Brian the Pekingese on a pajama review and I am so excited that they have let me review them again because how cute are these to in coordinating pajamas?! "One day, my mom and dad came home from the hospital with a little baby boy. I had never seen a person that small before. And it sure cried a lot. At bedtime, he seemed to like having me in the room next to his crib. He was relaxed, and so was I. That is when my parents got the idea for Brian the Pekingese® pajamas and plush toys. 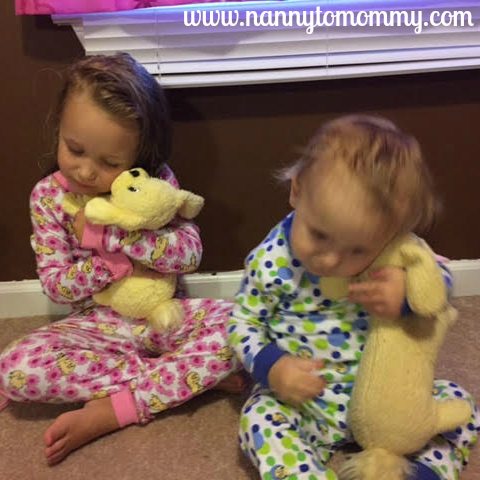 Our soft Brian the Pekingese® plush toy will be your child’s best friend to cuddle with at bedtime. Made from 100% fabric, he will surely inspire sweet dreams." I received a pair Daisy Print and Blue Polka Dot for little ones and of course they came with plushes too. These are high quality pajamas and the plush is so soft and cuddly. We gave our other one to Peanut and since both sets came with a lovey and we handed our old pajamas down to my niece, we are giving her one of the new plushes, so they will all be coordinating. So cute! 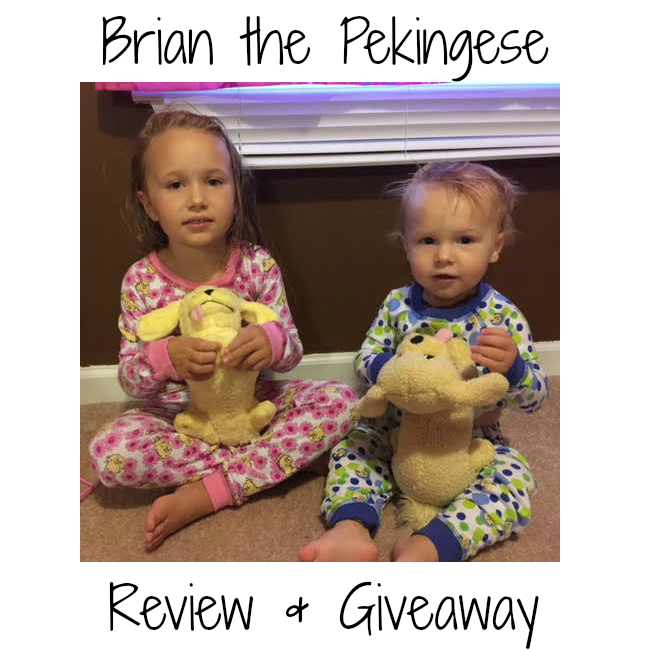 One lucky Nanny to Mommy reader will win a pair of pajamas from Brian the Pekingese that includes an adorable plush! Winner gets choice of size and color. This giveaway is open to US only (sorry) and must be 18+ to enter. Don't forget to check out my other giveaways. Good luck! Nanny to Mommy, Mama's Baby Cupcakes, Mommy's Favorite Things and the "Apparel for Fall" participating bloggers are not responsible for sponsors who do not fulfill prize obligations. I'd choose the pink for my niece. I would choose blue polkadot for my nephew if i won :) TY! I would choose the purple for my granddaughter Larkyn! I would select the purple daisy for my daughter. I would choose the blue polka dot for my son. I would chose the blue dots for my daughter who loves blue! I would choose the purple daisy print for my daughter. She would adore having pajamas with a dog to match! If I won, I would choose the Blue color for my son. I'd pick the blue one for my nephew. These are adorable! I would pick the purple daisy for my little cousin. I would pick the blue for my grandson Griff that lives here. He would love the dog that comes with them too. I'd pick the purple daisy print for my daughter, 3 yrs old. I would choose the Blue Polka Dot for my grandson! probably the brown ones for my son! I would love the pink daisy print for my daughter! She would love these! courtney hennagir on form. I like the Boys Blue Polka Dot Print Pajama! I think it would be a great gift for my nephew or I might even save it for our first little one! I would pick blue polka dot for my son, who is 21 months old! I want the pink pajamas for my granddaughter. I would get the blue polka dot for my son. I would choose purple for my daughter. She loves puppies and barks and says pup when she sees one. I would pick the blue polka dots for my nephew that will be 2 next month . I would choose the pink daisy print for my daughter, she loves pink and dogs! I'd choose the pink for my granddaughter. I would choose the pink daisy for my cousins little girl. I would love to choose the Blue Polka Dot for my nephew. I would choose the Purple Daisy Print Pajamas for my niece! I would choose the blue polka dot for my grandson. They would be for my son, so I would choose the brown ones. Very cute. Pink for sure, since I have 3 little ladies in my family! I would choose the boys Blue Polka Dot if I was lucky enough to win. I'd probably go with the pink for my daughter! i would choose purple for my daughter, thanks! I'd love to get the Purple Daisy Print for my daughter. I would pick the Purple Daisy print for my daughter - she'd love it! I'd pick the pink daisy design for my girls. I would choose the purple ones for my niece; she'd look so cute in them! I would choose purple for my daughter! I would pick the Daisy Print for my daughter. She would really love them and the plush. I would choose the pink pajamas for my daughter. I would choose daisy pink for my granddaughter. I would choose the pink daisy print for my daughter. I would choose the boys blue polka dot print for our son. I would choose the brown or the blue for my nephew! I would choose blue polka dot for my son!! So super cute!! I like the pink and I would give it to my niece. I would choose the blue polkadot for my son! If I won, I would select the brown or blue set for my nephew. I would choose the blue polka dot one for my son. I would get the pink. I think I would choose either the purple or the brown!! I don't know for sure! They are all so cute! Girls Purple Daisy Print Pajama is the pair of pj I would choose for my grand daughter. I would choose the purple for my daughter. I would pick the blue for my youngest son. I would like the Girls Purple Daisy Print Pajama for my daughter! So cute. I would choose a pink pair for my daughter! I would choose the set with the blue cuffs for my grandson! I'd choose the blue for my boys, wish they came in a bigger size for my daughter. I would choose pink for my oldest daughter! I think it is so adorable that these come with plushies, what a great idea! These would make perfect Christmas gifts as well. I would love to have the blue polka dotted one for my son. I would choose the pink for my three-year-old daughter. So cute! I would pick a pair of the girls purple daisy pajamas. My niece would be happy to wear them when she comes for a sleep over. I would choose the pink pair of pajamas. I chose those for my daughter. I would get the set for my daughter, she needs some fall time pjs. Thanks for hosting this! I would choose blue for my grandson, thanks! I'd get the purple girls daisy print for my 2 year old daughter. She refuses to have blankets on her, so she has to have nice pajamas! I would choose the blue & green polka dots. they would be for my grandsons birthday. thank you! I would choose blue polkadot for my nephew thanks for the chance to win. I would choose he purple pajamas for my niece. I'd choose the Girls Pink Daisy Print Pajama for my niece. Thanks. I would choose the girl daisy print for my daughter! I'd love the blue polka dot for my middle son! I think I would chose the blue ones. They would be for my son. We would love to have the purple ones for our granddaughter. I know she would love them. the purple ones for my daughter! I would choose the blue ones. My nephew would adore these and the puppy is too cute! I would choose the purple pj's if I won for my daughter Sophie. I would choose the pink one for my great grandchild! I'd choose the pink for my daughter. i would choose the blue pair for my son. I like the boys blue polka dot print for my grandson. I would choose the blue and green dots color. They would be for my grandson. So cute! Id love the brown ones for my son! The pink or purple ones for my daughter who loves her comfy jammies and dogs! I'd probably get the brown for my daughter! I like the purple daisy printed pajamas and that they will be for my niece. I would choose the pink daisy ones for my niece! Pink for my daughter! It is her favorite color. I would choose the purple pajamas. I would like to win this for my daughter. I would choose the pink daisy print and these would be for my little one.